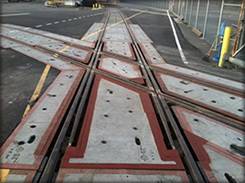 We build our grade crossings out of concrete for their durability and ease of installation. The elements have a long life span. Short road closures for as little as a day! 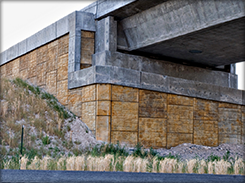 Also called noise walls, these structures block sounds from road traffic. They are a barrier to keep people, animals, and property away from traffic and safe from vehicular crashes. 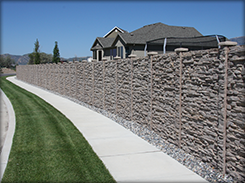 We also carry retaining walls that retain up to seven feet of soil. All walls can be stained to match geographical surroundings. We have a wide selection of aesthetically-pleasing styles and patterns to choose from. Magnum teams up with SSL for our Mechanically Stabilized Earth (MSE) walls. The MSEPlus walls are comprised of one universal panel, which has several advantages. One, it’s simpler to install. Instead of trying to piece together different-shaped panels, you have one type of panel used repeatedly throughout the project. Two, you’re in no danger of accidentally ordering the wrong type of panel. We have a tight quality control to ensure all products are of the highest caliber. Go to www.mseplus.com to find out more.